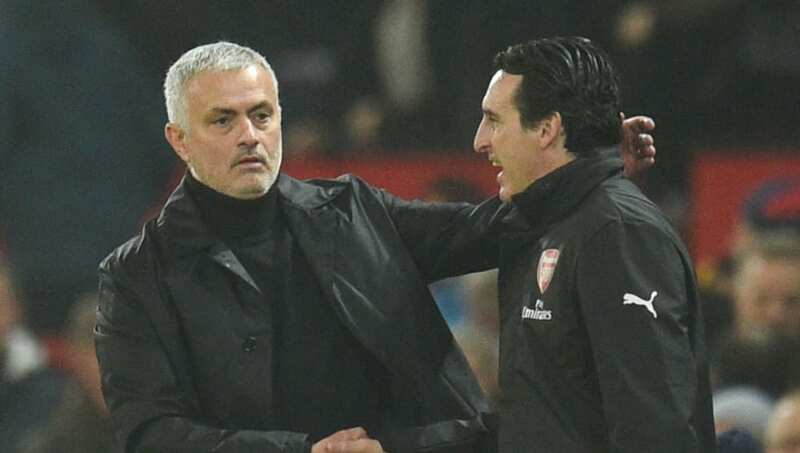 Manchester United and Arsenal were forced to share the spoils after a mistake filled clash at Old Trafford finished 2-2. It took 25 minutes for the game to spring into life, and it was a howler from David de Gea that would gift Arsenal the lead. A corner was swung in by Lucas Torreira and Shkodran Mustafi was inexplicably left with a free header, his effort was rather tame and into the ground, but de Gea could only palm over his own goal line. United responded just five minutes later, Marcos Rojo's free kick was palmed away by Bernd Leno but Ander Herrera - who appeared to be offside as the dead ball was taken - delivered the ball back across the face of goal and Anthony Martial was there to smash home and level things up. Rojo, who was already having a poor game, gave the ball away in a horrible position 67 minutes in that would set Arsenal away, substitute Henrikh Mkhitaryan raced away and slid Alexandre Lacazette in, but as the Frenchman went to shoot, Rojo slid in and kicked the ball into Lacazette's foot - De Gea could only watch the ball roll agonisingly in. United hit back straight from kick off, the response was so quick that the BT Sport cameras missed it. A simple punt forward from Rojo was allowed to bounce in the Arsenal area, no defender was awake and Jesse Lingard took full advantage to poke home and make it 2-2. Both sides completely forgot how to defend for the final 20 minutes and the result was a frantic, end to end match. Pierre-Emerick Aubameyang had a point blank effort saved by De Gea, and the forward had another effort stopped by the Spaniard just a couple of minutes later. Henrikh Mkhitaryan thought he'd won it in injury time after a Lucas Torreira effort was palmed out to him, he caught a left footed volley perfectly but was ruled offside. 2-2 was a fair result for a game that lacked in quality, but more than made up for it in entertainment. With no Paul Pogba in the starting XI, the main question hanging over United would be where their creativity would come from. The reality was that the home side moved the ball a lot quicker without Pogba slowing down play in the middle. There's no doubt the Frenchman is influential, but United benefited from not having his indecision in the middle of the park. It's food for thought for Jose Mourinho. Starting XI: De Gea (5); Bailly (7*), Smalling (6), Rojo (4); Dalot (6), Matic (5), Herrera (6), Darmian (6); Lingard (6), Rashford (6), Martial (7). Substitutes: Lukaku (N/A), Fellaini (N/A), Pogba (N/A). The centre back did an excellent job of keeping Aubameyang quiet for the majority of the match. He wasn't at fault for either goal and was a perfect physical match for Arsenal's star man. Eric Bailly with cramp in the 94th minute and it is well deserved. He's been the best player on the pitch for me whilst others have been very good. His first start since Newcastle and injury and he's been incredible. When you consider he had to do the job of two men (that's aimed at you, Rojo) his performance looks even more impressive. How this man still plays for a football club of the stature of Manchester United is a mystery. The centre back was booked for a dubious challenge in the first half that had Arsenal players pleading for a red. He was subbed off after 72 minutes, but not after he'd gifted Arsenal the lead after a horrible misplaced pass. This wasn't Arsenal at their best under Emery, and so they deserve respect for being able to come to Old Trafford and take a point home with them. Emery's men were a constant threat on the break, and although they looked shaky defensively they'll take a lot of confidence from how easily they cut through the home side. Starting XI: Leno (6); Sokratis (6), Mustafi (7), Holding (N/A); Bellerin (6), Torreira (7), Guendouzi (7), Kolasinac (7*); Ramsey (6), Aubameyang (6), Iwobi (6). Substitutes: Lichtsteiner (6), Mkhitaryan (6), Lacazette (6). Arsenal are a totally different outfit with this man in their side. Time and time again he was released down the left hand side. The Bosnian was unlucky not to end the game with multiple assists, and this performance will show Unai Emery that perhaps this system is the one to get the best out of him. He may be slightly suspect defensively, but going forward he offers something totally different to Nacho Monreal. In an Arsenal side that is so full of attacking players, Iwobi needed to take his opportunity against United. The Nigerian looked off the pace though, and more worryingly seems out of place on a stage that big. He was hooked off after 65 minutes and the difference between him and Lacazette was there for all to see. Both sides now have home games to look forward to, United will play host to Fulham and Arsenal will welcome Huddersfield to the Emirates.